"A hearty weeknight casserole with chicken, mushrooms, and a wild rice blend made rich and creamy with Classico® Fresh Four Cheese Alfredo Sauce." Preheat oven to 350 degrees F (175 degrees C). Spray 2-quart baking dish with non-stick cooking spray. Melt butter in a skillet over medium to medium-high heat. Add mushrooms and saute until they release some moisture and begin to brown, 4 to 5 minutes. Remove mushrooms from pan. Heat 2 tablespoons olive oil over medium heat in the same skillet. Saute chicken pieces until browned. Season with salt, pepper, and garlic powder to taste. 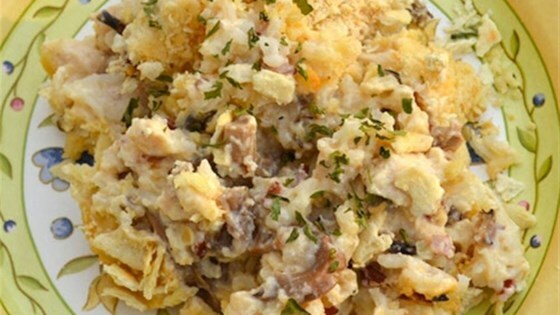 Combine the rice, chicken, mushrooms, and 3/4 of the jar of Alfredo sauce in the prepared baking dish. Mix well, and then spread remaining sauce over the top. Sprinkle crushed crackers evenly over casserole and drizzle 1 tablespoon melted butter over top. Bake until heated through and topping is golden, about 30 minutes. Garnish with parsley. See how to make a simple creamy chicken soup with wild rice. Followed recipe other than the much needed addition of broccoli. Myself and family just weren't big fans of the Alfredo mixed with wild rice. Not going to be making this one again. Next time I am going to make this with all wild rice, broccoli rather than parsley most likely I will leave the crackers off. It is a good recipe and a great one for personalizing.